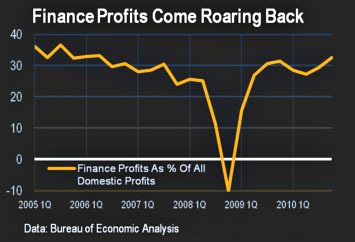 Chart of the Day: Finance is Back! Via Matt Yglesias, Kathleen Madigan reports that finance industry profits have recovered from their late unpleasantness and now account for over 30% of all corporate profits once again. Life is grand if you’re a plutocrat, isn’t it?